More than 6,000 years ago people were telling stories, but not with words. They captured their lives in pictures on the walls of caves and other rock surfaces. This was a preliterate time of human existence, or a time before language was written down and people were able to read and write. But the stories these ancients told in pictures still engage the mind in astonishing ways. These chroniclers of their times gave us the gift of ancient sight. We can see how life was lived thousands of years ago just by looking at these artfully painted images. How amazing is that? Today we are sharing with you a countdown of rock art from antiquity compiled by Ancient Origins, AntiquityNOW’s partner in educational curricula. While you’re at it, take a look at AntiquityNOW’s blog post on pictograms and petroglyphs and the stories they tell. As you explore the sometimes mysterious and but always glorious pictures that depict these cultures, think again how ingenious and inventive our ancestors were. And how they wanted so very much to be remembered. See the Lesson Plan on pictographs that follows the blog. It is crafted as an adjunct to the social studies programs currently used in the United States and correlates with the National Curriculum Standards for Social Studies. All materials are produced to enable teachers to address different ways of learning in children, particularly those with learning challenges. Rock paintings and engravings are among the world’s oldest continuously practiced art form and are as diverse as the wide-ranging cultures and civilizations that have produced them. Depictions of elegant human figures, richly hued animals, unusual figures combining human and animal features, and detailed geometric patterns, continue to inspire admiration for their sophistication, powerful forms, and detailed representations, as well as for providing a window into the daily lives of our ancient ancestors. 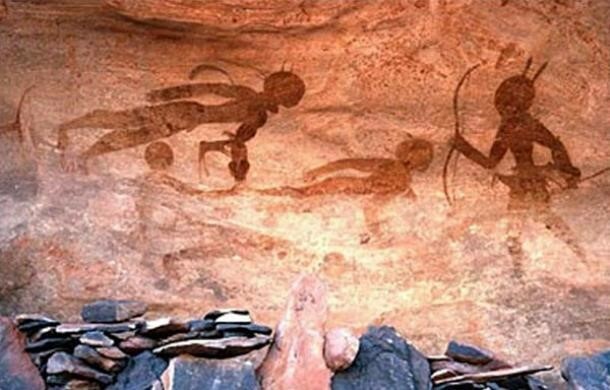 Here we feature some of the most amazing and mysterious examples of rock art from around the world, though there are thousands more that are equally as impressive. 10. 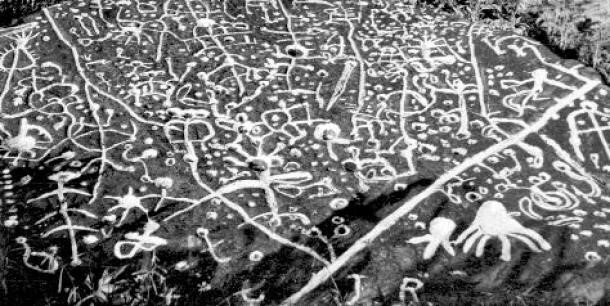 The haunting rock art of Sego Canyon – extra-terrestrials or shamanic visions? The sandstone cliffs of Sego Canyon are a spectacular outdoor art gallery of petroglyphs painted and carved by Native Americans peoples over a period of around 8,000 years. They are characterised by more than 80 imposing and haunting life-sized figures with hollowed eyes or missing eyes and the frequent absence of arms and legs. Some claim that the mysterious figures are evidence of alien visitation in our ancient past, while scholars maintain that the strange beings represent shamanistic visions produced in trance-like states. Last year, archaeologists discovered a rare example of prehistoric rock art in the Scottish Highlands. Researchers suggested that the large boulder, which contains numerous cup and ring marks, may reflect ritual use, territorial markings, or mapping of the stars. The carvings in the large stone, which was found in Ross-shire, Scotland, are believed to date back to the Neolithic or Bronze Age, around 4,000 to 5,000 years ago. However, precisely dating the art is difficult: even if the megalithic monument can be dated, the art may be a later addition. 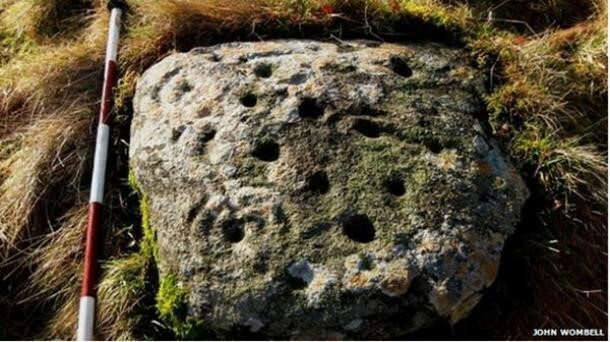 John Wombell, of North of Scotland Archaeological Society (NOSAS), described the finding as “an amazing discovery”, and explained that it is one of only a few decorated stones of its kind in Scotland. Cup and ring marks are a form of prehistoric art consisting of a concave depression, no more than a few centimetres across, carved into a rock surface and often surrounded by concentric circles also etched into the stone. The decoration occurs as a petroglyph on natural boulders and outcrops, and on megaliths such as the slab cists, stone circles, and passage graves such as the clava tombs and on the capstones at Newgrange. Cup and ring marks are often found carved on standing stones and at stone circles – places thought to have been used for religious and ritual purposes in the past. Carvings often occur on outcrop rock where the site appears to have been specifically chosen so as to give uninterrupted views over the surrounding country. Others have said that they correspond to star constellations, or that they are records of land ownership or reflect boundaries. Last year, archaeologists discovered a rock panel in the Kharga Oasis about 175 kilometres west of Luxor in Egypt, which is believed to date back to the pre-dynastic era, around 4,000 BC or earlier. Egyptologist Salima Ikram claimed the rock art is a depiction of spiders, webs, and insects trapped by spiders, and this theory dominated mainstream news reporting. However, since then, other researchers came forward with alternative explanations. Dr Derek Cunningham, author of ‘400,000 Years of Stone Age Science’, suggested that the linear comb patterns are in fact an archaic form of astronomical writing. He found that the angular offset of the ‘spider body’ and the many lines drawn on the panel, align with astronomical values considered central to the accurate prediction of lunar and solar eclipses. For example, the body of the proposed spiders are rotated by 13.66 degrees from vertical, a calculation which corresponds to half a sidereal month. Michael Ledo, author of ‘On Earth as it is in Heaven: The Cosmic Roots of the Bible’, among other works, provided another interpretation of the unusual rock panel. According to Ledo, the figures represent zodiacal and other constellations. Tassili n’Ajjer has been described as the finest prehistoric open-air museum in the world. Set in a vast plateau in the south-east of the Algerian Sahara at the borders of Libya, Niger and Mali, and covering an area of 72,000 square kilometres, Tassili is home to an exceptional density of paintings and engravings which record climatic changes, animal migrations and the evolution of human life on the edge of the Sahara from c 10,000 BC to the first centuries of the present era. Over thousands of years, successive groups of peoples left many archaeological remains, habitations, burial mounds and enclosures. However, it is the rock art, which was first discovered in 1933, that has made Tassili n’Ajjer world famous. The art comprises more than 15,000 paintings and engravings on exposed rock faces, and includes pictures of wild and domestic animals, humans, geometric designs, ancient script, and mythical creatures, such as men with animal heads and gods or spirit beings. The art covers five distinct periods, each of which corresponds to a particular fauna, and can be characterised by stylistic differences. While thousands of paintings and engravings from Tassili n’Ajjer have now been recorded, it is likely that there are many more yet to be found. The images have shed light on the lives of the ancient people of the Sahara but have also left us with many questions about who painted them and what it all means. 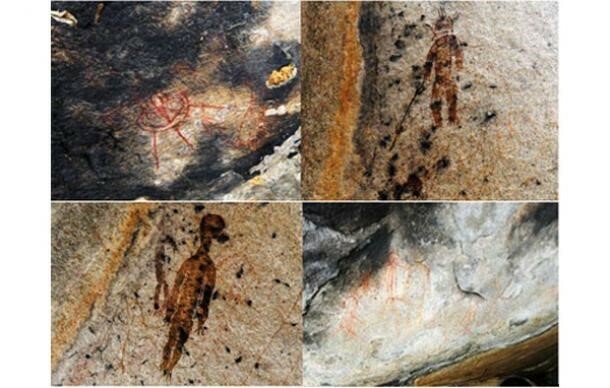 In July 2014, the State Department of Archaeology and Culture in Chhattisgarh, India, sought assistance from the Indian Space Research Organisation to research a set of ancient rock paintings found inside caves near the town of Charama in Kanker district, in the tribal Bastar region. According to one archaeologist, the art reflects the belief among ancient humans that we are not alone in the universe. Bhagat has not made reference to the fact that the paintings in question depict what, in other contexts, archaeologists typically identify as shamanic images of humans, human-animal hybrids, and geometric forms. Images of figures with antlers, antennae, or spirit rays are familiar in shamanic art. 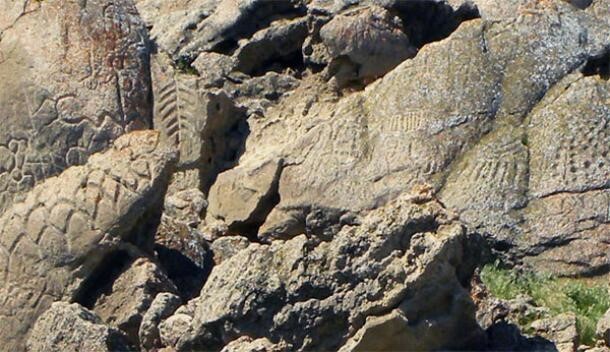 A set of petroglyphs in western Nevada dated in August 2013 to between 10,500 and 14,800 years old, are the oldest rock art ever found in North America. The previous oldest rock art in North America was dated at 6,700 years old and can be found at Long Lake in Oregon. The ancient petroglyphs in Nevada are carved into limestone boulders located on the west side of the now dried-up Winnemucca Lake. The rock art includes both simple petroglyphs such as straight lines and swirls and more complex petroglyphs that resemble trees, flowers, or the veins of a leaf. There is also a series of abstract designs that look like ovals or diamonds in a chain. The deeply carved lines and grooves in geometric motifs share similarities with the petroglyphs found in Oregon. However, the meaning and symbolism has not yet been deciphered. With dozens of grooved spirals, carved indentations, geometric shapes, and mysterious patterns of many kinds, the Cochno Stone, located in West Dunbartonshire, Scotland, is considered to have the finest example of Bronze Age cup and ring carvings in the whole of Europe. Yet, for the last 50 years it has laid buried beneath several feet of earth and vegetation in what was a desperate attempt at the time to protect it from vandals. The stone, which measures 42ft by 26ft, was first discovered by the Rev James Harvey in 1887 on farmland near what is now the Faifley housing estate on the edge of Clydebank. It is covered in more than 90 carved indentations, known as cup and ring marks. The cup and ring marks, which are believed to date back some 5,000 years, are accompanied by an incised pre-Christian cross set within an oval, and two pairs of carved footprints, each foot only having 4 toes. 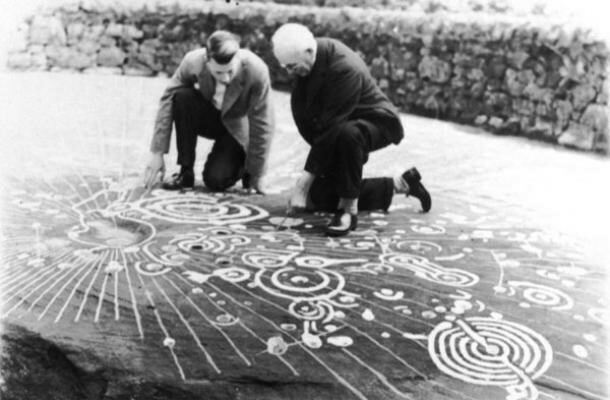 Because of the array of markings on it, the Cochno Stone has been recognised as being of national importance and designated as a scheduled monument. During the 1960s, the Cochno Stone was repeatedly damaged by vandals, so in 1964, Glasgow University archaeologists recommended it be buried to protect it from further damage. The stone has been covered ever since. However, the local council is now considering whether to reveal the spectacular stone once again. The Worora, Ngarinyin and Wunumbul people are the three Wandjina tribes – these tribal groups are the custodians of the oldest known figurative art which is scattered throughout the Kimberley. Perhaps what is most interesting about their figurative art painted on rocks and in caves is the way in which they have represented the Wandjinas – white faces, devoid of a mouth, large black eyes, and a head surrounded by a halo or some type of helmet. The oral account of the Wandjinas has been passed from generation to generation as all of the Aboriginal Dreamtime stories have. 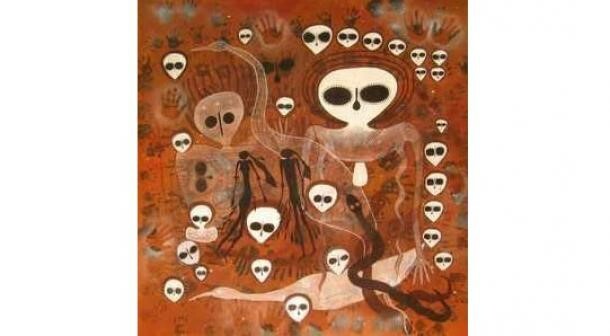 The story goes like this – the Wandjina were “sky-beings” or “spirits from the clouds” who came down from the Milky Way during Dreamtime and created the Earth and all its inhabitants. Then Wandjina looked upon the inhabitants and realised the enormity of the task and returned home to bring more Wandjinas. With the aid of the Dreamtime snake, the Wandjina descended and spent their Dreamtime creating, teaching and being Gods to the Aboriginals whom they created. After some time, the Wandjinas disappeared. They descended into the earth and since then, have lived at the bottom of the water source associated with each of the paintings. There, they continually produce new ‘child-seeds’, which are regarded as the source of all human life. Some Wandjina also returned to the sky, and can now be seen at night as lights moving high above the earth. In North Carolina, in the mountains of Jackson County, lies a large mysterious rock full of petroglyphs yet to be deciphered. For the Cherokee Indians the rock is of special importance and the site where the rock resides is a sacred site where ceremonies used to take place. The name Judaculla comes from the Cherokees who believed that it was an ancient creature which dominated the mountains. Its name means ‘he has them slanting’ or the ‘slant-eyed giant’ – a powerful being with super-human powers with the ability to fly that used to jump from mountain to mountain and was even capable of controlling the wind, rain, thunder and lightning. The creature was able to take ordinary people to the ‘Spirit’ world and was able to communicate with people. It appears to be a similar type of ‘god-like’ creature as the ones mentioned in all mythologies around the world. Judaculla was said to have once landed on the rock, leaving on it a seven fingered hand print. The stone is a curvilinear shaped outcrop of soapstone rock with more than 1,500 petroglyphs all over it. The ages of the petroglyphs are estimated to be between 3000 and 2000 BC and during digging around the stone, quarry tools were discovered. No other stones in the area were found with similar markings, making the stone quite mysterious. Interpretations of the petroglyphs are abundant. They span from maps, to religious symbols with a secret message, or just graffiti of ancient people. They may represent animals or humans or other figures of importance. 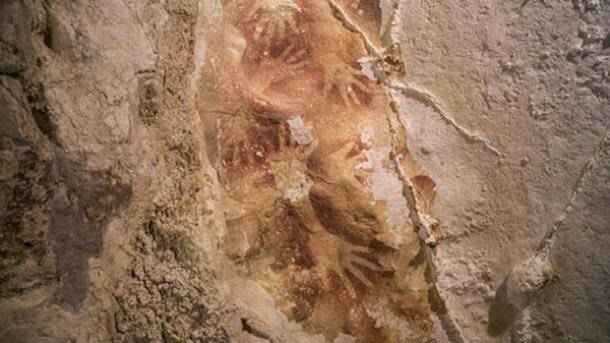 A study published in October 2014, in the journal Nature, revealed that more than 100 ancient paintings of hands and animals found within seven limestone caves on the island of Sulawesi in Indonesia, are as old as famous prehistoric art in Europe. The research showed that humans were producing rock art by 40,000 years ago at opposite ends of the Pleistocene Eurasian world. Maxime Aubert, study lead and archaeologist and geochemist of Australia’s Griffith University, explained that before this discovery, experts had a Europe-centric view of how, when, and where humans started making cave paintings and other forms of figurative art. However, the fact that people in Sulawesi were also producing art at the same time suggests that either human creativity emerged independently at about the same time around the world, or when humans left Africa they already had the capacity and inclination for art. Create a pictograph of your life. Include images that represent your personal history, your likes and dislikes, your dreams, the things that you enjoy doing, your family, the people who are important to you, etc. Share your pictograph with a classmate and see if he/she can interpret your life story. Group Activity – Create a pictograph/mural of your class using a long sheet of paper. Did you ever think about how you and your classmates have your own culture with all the unique behaviors of a specific group? How do you illustrate your classmates as a culture? As individuals? What are the unique qualities of your class and you as students? How do you show this? Why do you think ancient people, regardless of the time period or geographical area, drew pictures of their lives? What does it mean to “memorialize” your times? To “memorialize” yourself? Write an essay (250-500 words) discussing this concept. 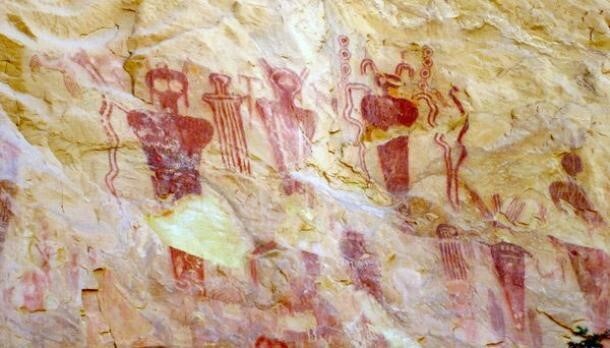 Why do you think some people see space aliens in the pictographs? What are the arguments in favor of this view? Opposed to this view? Write an essay (250-500 words) stating the facts v opinions on this topic. How do we use pictographs today? In what places are they common? Why do pictographs replace writing on signs? How do we use them in charts and mathematical calculations? See how many pictographs you can find from around the world that are in current use. Here’s an example from AntiquityNOW’s blog to get you started. This entry was posted in Ancient Origins, Art, Blog, Communications, Culture, Education, Public Life and tagged ancient communications, ancient history, Ancient Origins, AntiquityNOW, pictograms, pictorgraphs, rock art, social studies. Bookmark the permalink.